Minicare (no nail) . . . . . . . $40 15min. SPA Manicure . . . . . . . $70 Allow 45min. Nail care & Polish . . . . . . . $55 Allow 30min. Paint only . . . . . . . . . . . . . . $15 Allow 10min. French Polish . . . . . . . . . . . $15 Allow 10min. SPA Pedicure . . . . . . . . . . . . $70 Allow 45min. Nail care & Polish . . . . . . . . . . . . $55 Allow 30min. Paint only . . . . . . . . . . . . . . $20 Allow 15min. French Polish . . . . . . . . . . . . $20 Allow 15min. 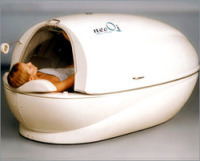 The NeoQi is a specialised SPA capsule that is designed to be a complete system for relaxation. 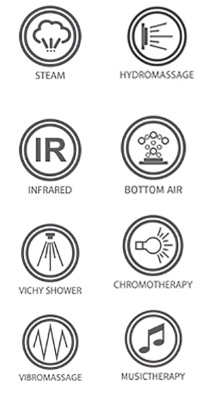 - Peeling + Infra Red and Vibromassage 10-15min. Session includes Chromotherapy (Led Lights) and Musicotherapy to relax and stimulate your mood. We ask you to give us at least 24 hours notice before the scheduled appointment time to avoid a 50 % cancellation fees of the treatment price. A No-Show will incur a charge of the full treatment price. Should you be late, your treatment will finish according to the booking time and you will be charged the full treatment price. Late cancellations or no show for gift voucher bookings will result in your voucher being redeemed in full.